As low as $14.96 per Full Aerosol Case! **Aerosols not currently eligible for free shipping. Kills rust and chemically converts it to a durable abrasion & corrosion resistant polymer resin. No sanding, wire wheeling, grinding or sand blasting necessary. 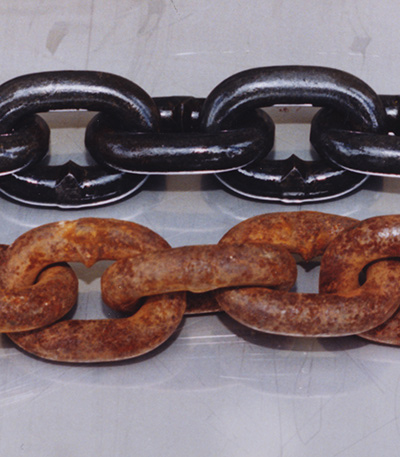 Instantly turns rust into a black super hard polymer resin that will never re-oxidize- guaranteed. When viewing our before and after images of Blackstar at work, the actual color may be different depending on your monitor screens resolution. Blackstar Rust Converter acts as an outstanding primer or final coat. 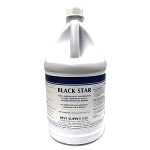 Blackstar can be top coated with any oil or solvent based coating such as epoxies, enamels, urethanes, etc. . Black Star is in use by thousands of Ranchers & Farmers, Auto body shops, Cruise ship lines, off shore oil platforms, municipal highway & transportation departments as well as the U.S Navy & U.S. Coast Guard. Guaranteed! 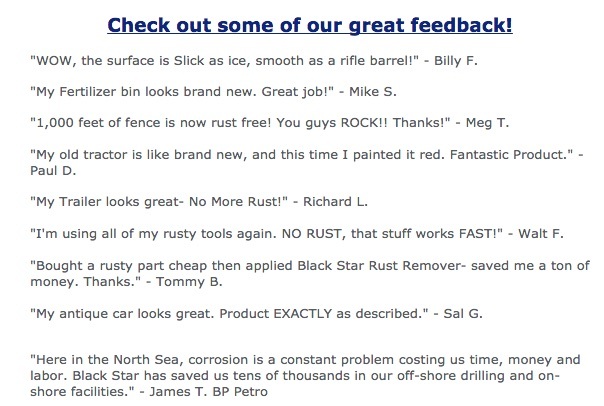 MROCHEM’s Blackstar Rust Converter is our very best rust conversion high-tech formula. 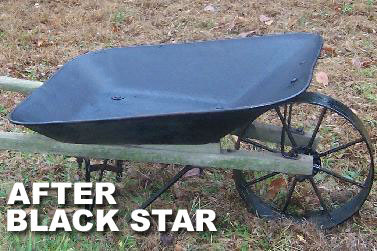 In the harshest weather Black Star kills rust dead. For use on any metal exposed to weather or corrosive chemicals including cars, trucks, trailers, marinas, oil rigs in the ocean, Bridge structures, steel metal barns & sheds, grain bins, metal roofs, fences, or metal surfaces exposed to rock salt. 1000’s of uses! representations of actual product color due to variance in monitor calibrations. What is the coverage of Blackstar Aerosol & gallon sizes? Each gallon will cover approximately 400-500 square feet. Coverage will vary depending on how much rust you have, type of metal, etc. What is the surface preparation procedure? Hose or power wash off any dirt or debris. Allow to dry. Then apply Black Star with a sprayer, brush, a roller or even just a rag. Some users dip rusty parts in for complete immersion. 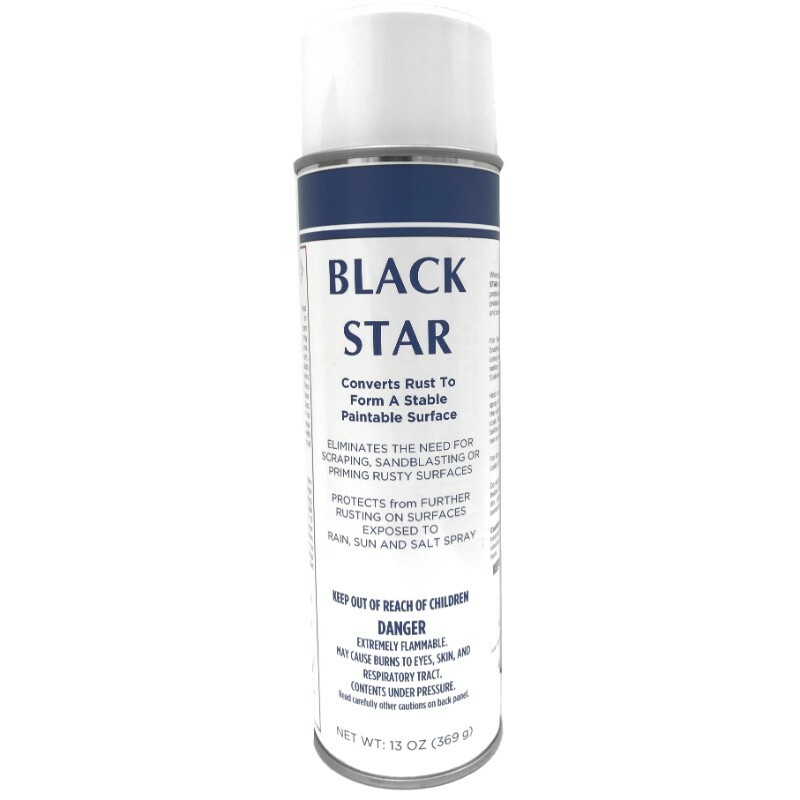 The surface will start to turn Black 20 Minutes after applying BlackStar. This is when the Rust is turned into an Inert Polymer Coating that is bonded to the metal. After it dries you can leave it as is or paint over it with any color you like. Application Questions? Please call us at 800-788-9195 and a product specialist will walk you through the application. All directions are on the label. Call 800-788-9195 for Bulk Pricing on 55 gallon drums & container sizes! What is the coverage per gallon? Each gallon will cover approximately 400-500 square feet. Coverage will vary depending on how much rust you have and the type of metal etc. Hose or power wash off any dirt or debris. Allow to dry. Then apply Black Star with a sprayer, brush, a roller or even just a rag. Its that simple! Does it matter what kind of metal I have? No not at all. 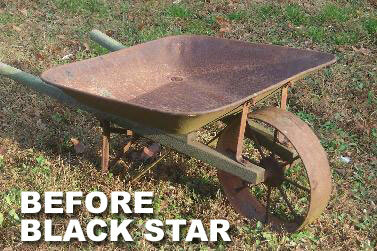 Black Star will convert rust on Steel, Iron, galvanized and corrugated and many other metals. Black Star works equally well on flat, or angled surfaces as well as nuts, bolts, screws, welded seams, and tools! If I have a question on application who do I call? Call 800-788-9195 and one of our knowledgeable product specialists will help you. Call now to speak to one of our product specialists!! Great product! We are able to stop the rust on machines and now have alot less painting. I used this product on the chassis and frame of my rusted out F150. This product worked excellent and as advertised. It was easy to work with and clean up. Very pleased with this. Your Price: As low as $7.50 per can!